If your IRS Audit case goes at all beyond filling out the most basic IRS form it is a good idea to consult with an IRS tax attorney. Unless you have significant experience dealing with IRS audits in the specific matters surrounding your case, it is very easy to provide certain information or present your information in a way that will cause a revenue agent to broaden their IRS audit. 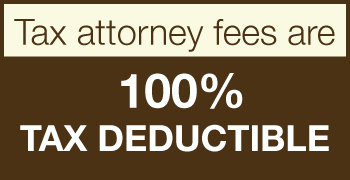 If your case involves any level of complexity it is critical to consult a tax attorney to ensure that any potential pitfalls are avoided and that your case is presented in a manner that will both protect your interests and encourage the revenue agent to see this as an open and shut case. The IRS uses a systematic formula to determine which income tax returns they'll audit. They use your reported amounts on your tax return to calculate a discriminate function score. The score compares your income and expenses that you report on your tax return to other tax payers in a similar profession to determine whether it's likely that you understated income or overstated deductions. The discriminate function score also analyzes your investments, rentals, business, filing status, where you live, and how many people are in your family. Generally, if you're a high income tax payer, there's a higher likelihood they will audit you because they know they will generate more money from their audits. In addition, if there are particular expense and loss items on your return that are out of the ordinary for your profession, those returns will get audited, as well. The IRS selects a certain number of tax payers to audit at random. Last, the IRS looks at specific industries or professions. Right now, the IRS is looking at the construction or building industry for under-reported 1099s, overstated deductions, and paying workers in cash to avoid the payroll taxes. Several years ago, they audited attorneys. The industries or professions that the IRS audits change every few years. In the event that you're audited, please call this tax law firm because we'll use the most advanced audit defense techniques and the most aggressive representation possible to give you the best audit results. When dealing with an IRS audit, everything is a negotiation. The revenue agent has the right to expand their audit into additional years, different types of tax and different entities. The sooner and more fully you can shut the door on those dangerous questions by showing that you have good work documentation and figures that fully reconcile, the quicker you can get out of the IRS audit. Here in the United States we have a voluntary tax system. That doesn't mean that you voluntarily pay tax, what it means is that you voluntarily report your financial information and pay taxes based on the information you provide to the IRS. Then the IRS has 3 or 6 years to go back and audit your finances to determine whether or not the information you have provided is correct. So, an IRS audit is just the IRS using their rights to review your financial information and determine if you have paid the correct amount of taxes and acted in accordance with the law. 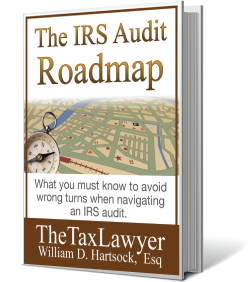 With over 30 years experience representing client interests and battling IRS auditors, Mr. Hartsock has literally written the book on IRS audits. When facing an IRS audit it is critical to understand not only the facts, but the strategies that the IRS will use to find what they are looking for. Whether your audit is a straight forward matter, or an eggshell audit where you potentially harmful issues exist that the auditor is not yet aware of, you could not be in better hands than those of William D. Hartsock. There are many specific IRS audit triggers. The number one IRS audit trigger is when the information that has been reported on your income tax return simply doesn't flow well compared to persons or entities with similar demographic profiles. The IRS selects returns to audit based upon a Discriminate Function Score. Your DIF score increases if your tax return reports numbers that are significantly higher or lower than the average of other taxpayers in your same profession and locality. There are also special IRS audits, such as where they select all returns from a particular tax preparer whose prior IRS audits substantially understated income or grossly overstated deductions. In addition to the above, IRS audit triggers also include randomly selected persons from several different categories of tax payers. 2%-4% of the general population in the low and middle income classes are subject to random IRS audits. The IRS audits 5%-10% of mid-high income earners, above $60,000 Income/year. 7% of small and midsize corporations face IRS audits, along with all corporations whose gross income exceeds $100,000,000. 5% of partnerships go through IRS audits. 20% of estates are subject to IRS audits. Another special IRS audit would be all individuals with foreign bank accounts or foreign assets. There are rules and regulations that the IRS must comply with during an IRS audit. These IRS audit procedures mandate that they must inform you that an audit is being conducted, what they must do in the event they cannot get in touch with you because your last known address is no longer current, etc... Only if you know what those procedures are can you ensure that the IRS complies with all of the procedures which are really protections of your rights during the IRS audit process. Knowing these IRS audit procedures often allows you to slow down the IRS agent and dissuade them from extending their audit into additional years, types of tax and entities. The IRS has an enormous amount of power and the would use that power without restraint or control if congress had not put these tax audit procedures in place to protect the rights of taxpayers. You have to take advantage of these IRS audit procedures because that is how you get a fair result. Tax audit defense is negotiation to a great extent. IRS audit defense is negotiations from the first telephone call, through the initial audit meeting, from the presentation of documents to the explanation of each one of the items during the audit. You must know the rules and regulations that the IRS is supposed to comply with to ensure that they do in fact comply with those procedures. Throughout the process your negotiations are setting you up for an appeal down the road, it's negotiations that may be setting the groundwork for tax litigation and you need to know that early in the process, before giving them all of the books and records. A big part of presenting a solid tax audit defense is ensuring that the books, all financial records and documentation are in meticulous order. When a person simply has a "shoebox" of documents, you cannot go in with that shoebox of documents because that tells the revenue agent that they need to audit everything because all you have been doing on your income tax returns is estimating. You have to go through all of the receipts, input them into Quickbooks (or similar financial program) and make it appear as though you have been doing everything correctly from inception. This level of tedious preparation makes a vast difference in the tone an pace of an IRS audit. The Tax Lawyer, William D. Hartsock has been defending tax payers rights against IRS, FTB and EDD audits since the 1980's. Mr. Hartsock is very familiar with not only the rules and procedures that the IRS audit must follow but also with the defense strategies that get the best result available under the law. It's all a matter of strategy. Strategy is the key. You must know where your areas of both strength and weakness are in order to successfully negotiate an IRS audit and mitigate any potentially negative outcome. For over 25 years this firm has achieved the most favorable outcome possible for our clients through successful IRS audit defense strategies. 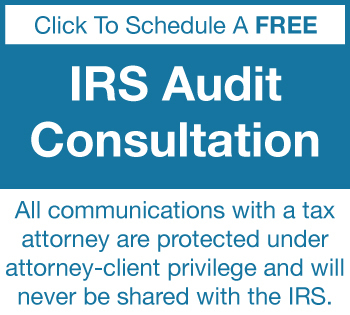 Call today to schedule your free IRS audit consultation.